Products of Design students spent a recent Saturday in Washington, DC for an all-day Afghanistan policy simulation at the Georgetown University Institute for the Study of Diplomacy. The eight-hour game required student delegates to apply design thinking to high-level negotiations around seemingly unsolvable issues integral to the future development of Afghanistan. "It was stimulating to act as a visual or lateral thinker in that environment," said Gaïa Orain '14. "As a designer, I was able to contribute translation skills to group discussions by making cerebral concepts more tangible. When something is literally on the board, bilateral or trilateral negotiations move to understanding and discussion more readily." Products of Design was generously hosted by Dr. Ann Van Dusen, Director of the Georgetown University School of Foreign Service's Master's in Global Human Development. 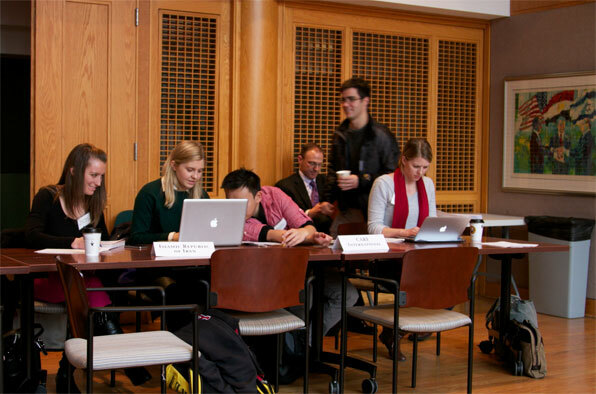 In a simulation crafted by Lt. Col. William Walpert, students played negotiating parties including the Islamic Republic of Pakistan, Afghan civil society leadership and key international nongovernmental organizations (NGOs). Topics covered included paths to reconstruction following the withdrawal of military forces; regional balance-of-power contests; internal power struggles; and evolving policies on topics such as human rights, health access, economic justice, counter-terrorism and corruption. Playing leader of an NGO with deep regional operations, Willy Chan '14 summed up his experience protecting field workers from the Taliban: "Intense!" 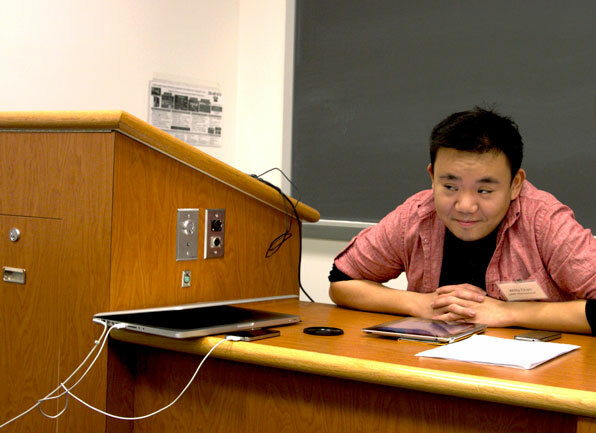 Willy Chan '14 experiences a moment of incredulity as director of CARE International. "From a Swedish perspective, Georgetown was a cultural immersion–from staying on campus, to learning the social cues of a multilateral United Nations environment," said Charlotta Hellichius '14. "The Georgetown students were talented, eloquent, and very inquisitive about the Products of Design angle on systems thinking. We shared strategic and tactical ways in which today's designers catalyze positive change, beyond just making objects look nice." Designers had the advantage of seeing policy organizations as service systems. Orain said that the simulation also taught her "new negotiation strategies that are not limited to foreign policy and diplomacy. Many situations in the life of a designer call for negotiation, whether these be contract stipulations, RFPs, or relationships." "Our counterparts were economics and international relations scholars–and, like us, the inaugural class of their program," concluded Hellichius. "We shared a sense of greater purpose, and a sense of pride as pioneers. I'm incredibly grateful for their hospitality."